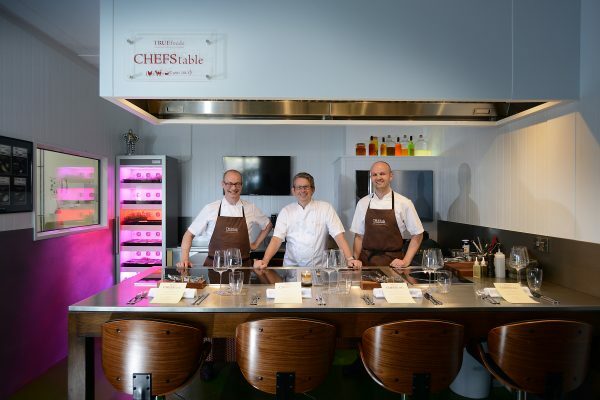 Yorkshire’s biggest dining secret, CHEFStable by TRUEfoods in Ripon, is bringing together some of the UK’s leading chefs this February for its new ‘Up Close and Personal’ series, which is set to be a culinary experience like no other. Chefs Clare Smyth (Core by Clare Smyth, Notting Hill), Sat Bains (Restaurant Sat Bains, Nottingham), Paul Ainsworth (Paul Ainsworth at No.6, Padstow), Luke Selby (Hide, Mayfair) and Michael Wignall (The Angel at Hetton), who between them boast six Michelin stars, will each host their own dinner at CHEFStable by TRUEfoods from 18 – 23 February – all in the name of charity. Since launching, CHEFStable at TRUEfoods has welcomed top guest chefs, including Chef David Breeden of the French Laundry in California and “Up Close and Personal” is set to take the experience to the next level over six consecutive nights. The Mitchells have created this charity event to give back to the melanoma charities that support hospitals and research in this area after their son and Director of TRUEfoods Simon Mitchell received treatment a few years ago and again in 2018. The proceeds of the dinners will be shared between Leeds Melanoma Institute and Melanoma Focus and the chefs’ charities of choice. Sponsored by Wellocks, Aubrey Allen, Rudding Park Hotel and Goodfellow & Goodfellow, the dining experience is open to anyone to attend. Places are allocated via a bidding process, with the highest bidders securing one of the coveted 10 places at the table. To make a pledge please call Simon at TRUEfoods on 01765 640927. To find out more about bidding for a place at ‘Up Close and Personal’ contact Simon via email: [email protected], call: (0)1765 640927or DM via Twitter @TRUEfoodsltd. TRUEfoods is a privately-owned business that makes and sells fresh stocks made without compromise by using traditional culinary principles, 100% British-sourced bones, a direct source of filtered spring water, and carefully sourced UK vegetables. Only pure, natural ingredients are used -no flavour enhancers or life extending ingredients. The TRUEfoods retail brand sits on the shelves of selected retailers and produces ‘Heston from Waitrose’ stocks and sauces. Its wholesale stock pouches are used in kitchens throughout the UK, Ireland, Europe, and much further afield. Many kitchens awarded with multi-Michelin stars, independent restaurants, contract caterers, and businesses within the leisure sectors also use TRUEfoods stocks. The TRUEfoods product portfolio extends beyond stocks and sauces to chef-prepared pâtés, terrines and bespoke recipes. The newest addition to the business is The Bakery, a chef-led business which produces savoury pies and tarts. The same TRUEfoods quality principles apply to this unit with the pies and tarts being packed full of succulent meat and sauces made from TRUEfoods stocks. For further press information please contact Jessica Sneddon at Sound Bite PR: [email protected] or call 0138 382 8239.